Not turning white but stays green and falls off. Multiple flowers not becoming a tree flower. 15 years old and flowered last year. Make sure your Lilac is receiving adequate water. Water stresses can cause leaves and flowers to drop. Pruning can rejuvenate a lilac and stimulate flowering the next spring. 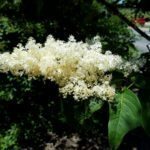 Here is a link about Japanese Lilac.